In autumn 2015 Guitar Hero Live appears and brings a new controller with it. But that's not enough; you can also play against a real audience along with real band and learn what it feels like to be a real rock star and how mercilessly the mass may be under certain circumstances. 1. A Day to Remember: "Right Back at it Again"
2. Alice In Chains: "Stone"
3. Alter Bridge: "Cry of Achilles"
4. Alt-J: "Left Hand Free"
5. Angus & Julia Stone: "A Heartbreak"
6. Anthrax: "Got the Time"
8. Beartooth: "I Have a Problem"
9. Black Veil Brides: "In The End"
11. Bring Me The Horizon: "Shadow Moses"
12. Broken Bells: "Leave It Alone"
13. Bullet For My Valentine: "Temper Temper"
14. Catfish and the Bottlemen: "Kathleen"
19. Fall Out Boy: "My Songs Know What You Did In The Dark (Light Em Up)"
20. Gary Clark, Jr .: "Do not Owe You A Thang"
21. Green Day: "Nuclear Family"
22. Halestorm: "Love Bites (So Do I)"
23. Judas Priest: "Breaking the Law"
24. Killswitch Engage: "In Due Time"
25. Marilyn Manson: "Disposable Teens"
26. Marmozets: "Move Shake Hide"
28. My Chemical Romance: "Na Na Na"
29. Neon Trees: "Everybody Talks"
31. Of Mice & Men: "Bones Exposed"
32. Pantera: "Cowboys From Hell"
33. Pearl Jam: "Mind Your Manners"
34. Pierce The Veil: "King for a Day (feat Kellin Quinn.)" 35. Queen: "Tie Your Mother Down"
36. Rage Against the Machine: "Guerrilla Radio"
37. Red Hot Chili Peppers: "Higher Ground"
38. Rise Against: "Tragedy + Time"
39. Royal Blood: "Little Monster"
41. Sleigh Bells: "Bitter Rivals"
42. System of a Down "Chop Suey!" 43. Soundgarden: "Been Away Too Long"
45. The Black Keys: "Gold on the Ceiling"
46. The Killers "When You Were Young"
47. The Lumineers "Ho Hey"
48. The Pretty Reckless: "Going to Hell"
49. The Rolling Stones: "Paint it Black"
50. The War on Drugs: "Under the Pressure"
52. Vista Chino: "Sweet Remain"
55. OneRepublic - "Counting Stars"
57. The Mowgli's - "San Francisco"
58. Cypress Hill ft Tom Morello -. "Rise Up"
59. Asking Alexandria - "The Final Episode"
60. The Vines - "Metal Zone"
61. Wolf Alice - "Moaning Lisa Smile"
62. Disturbed - "Down With The Sickness"
63. TV On The Radio - "Lazerray"
64. Foster the People - "Coming of Age"
Activision has unveiled more new songs that will be on Guitar Hero Live, the next installment of the musical saga that will make its return this year after having been missing for a while. This time we find artists such as Lamb of God or-vocalist Gerard Way of My Chemical Romance to Pearl Jam or Wavves. You can see here the full list. Guitar Hero Live will be a big change compared to that seen in the original games. Besides having an entirely new guitar, now we see the first-person shooter to observe the reactions of the public. Guitar Hero Live will be released in the autumn of 2015 for Xbox One, PlayStation 4, Wii U, PlayStation 3 and Xbox 360. 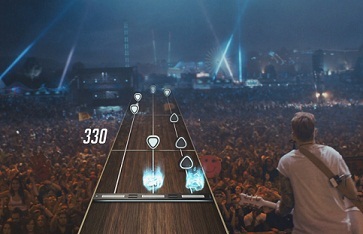 It is the first Guitar Hero game since Guitar Hero: Warriors of Rock, which was released in 2010. If you like the Rock Band series, then you look at what tracks will be available in Rock Band 4.